The year 1995 gave the world some truly great things. And no, I'm not just saying that because it's my birth year. Although that is a pretty good reason. In 1995, eBay was founded, the DVD was first devised, Disney created Pocohontas, and Head of Steam opened their first pub. 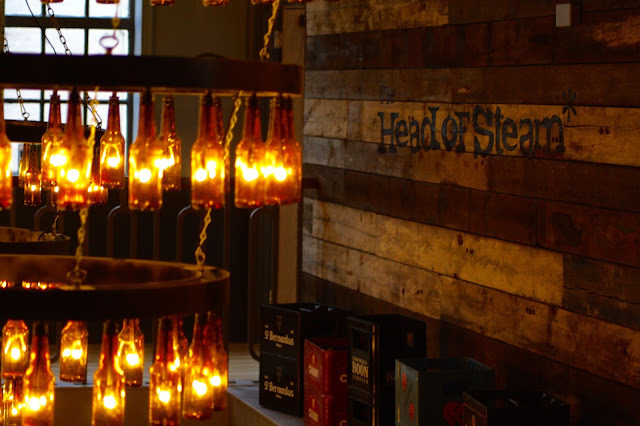 If you're a born and bred southerner such as myself and have never heard of them before, Head of Steam originally hail from the north, but are aiming to connect London with Scotland through a chain of pubs in every major city with a train station. Along this route, the Head of Steam are now branching out into the Midlands, with venues in Nottingham, Birmingham and, of course, Leicester. The atmosophere in the pub was very warm and welcoming. The decor was rustic but upmarket - I especially liked the chandeliers made from beer bottles! The venue was very spacious. Although it was busy during our press event, it didn't feel hectic or like you were crammed in like sardines as you often feel during peak times at comparable pub venues such as Wetherspoons. 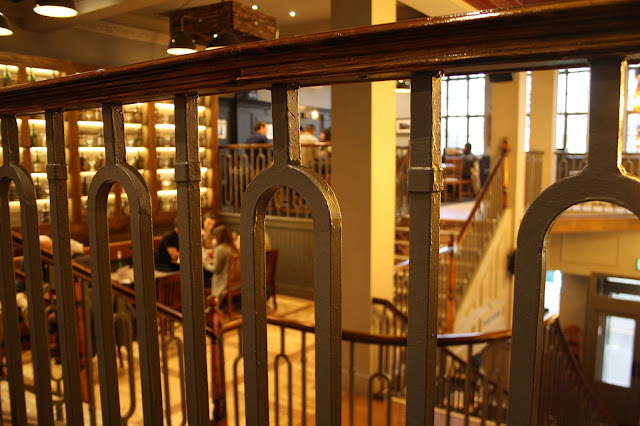 You won't be short of places to find a seat either, the pub is laid out over two floors with comfy armchairs and traditional dining tables aplenty, ideally suited to meals with friends and family or a relaxing evening tipple. I have also heard that there is a beer garden at the rear of the pub, which would be lovely to experience in the summer. Another big bonus for animal lovers like me is that the Head of Steam is dog friendly! Because who doesn't want to bring man's best friend along for Sunday lunch!? The quality of the food that we sampled at the Head of Steam couldn't be faulted. Ellis and I thoroughly enjoyed the vegan spinach and falafel burgers that we selected from the menu. 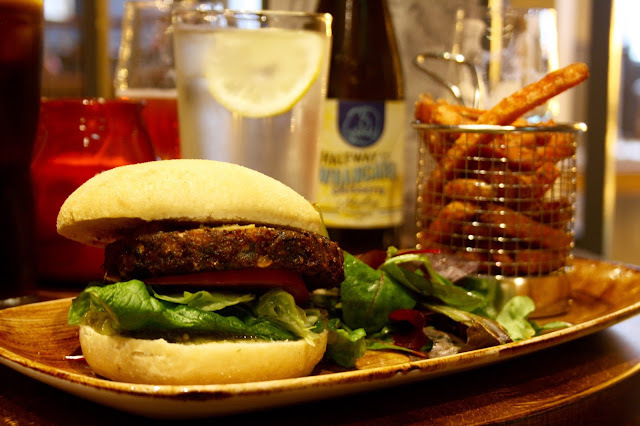 We were pleased to note that this burger was one of two vegan main course options offered by the Head of Steam, the other being a red lentil and chickpea dahl. It's fantastic to see pubs such as this being more inclusive with their menus, long may this continue! However, if you are vegan do watch out for some of the labelling on the Head of Steam's menu. A grilled halloumi and red pepper wrap from their sandwich selection is marked as vegan which seems to be an error as halloumi is cheese and therefore an animal product, so do consult your server to double check. But anyway, back to our burgers! We chose for our burgers to be accompanied by sweet potato fries and I must say that these were easily the highlight of the meal. They were absolutely delicious and I would return to the Head of Steam in future just to have these fries again! They were everything that a good fry should be: Extremely flavourful and moreish with a crisp exterior and soft, fluffy insides. Plus they elicited from Ellis one of the best quotes of the night: "Oooh Abbey get your mouth round these chips!" so they definitely are memorable! As for the burger itself, the patty certainly surprised me with just how juicy it was! Many vegan burgers that I've had at restaurants in the past have been incredibly dry, but this burger was perfect. It was moist without being oily or sticky. The spicy salsa and chickpea dahl inside the bun gave it an extra kick too. The bread bun was great quality and didn't weigh the meal down. The main course definitely receives a thumbs up from me! Now onto pudding! 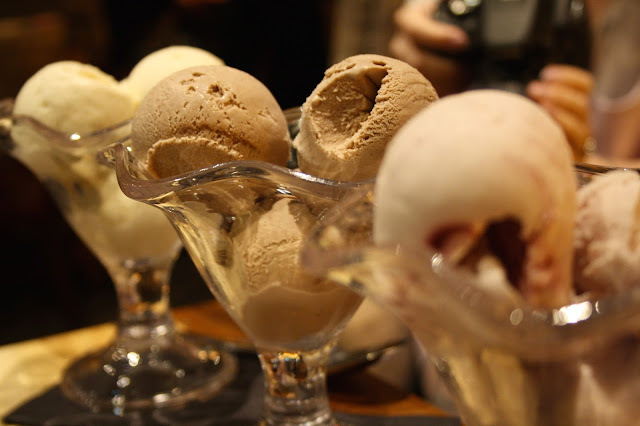 I was very excited to see that the Head of Steam had a vegan dessert option, an ice cream selection. The raspberry ice cream was just mouthwatering, very creamy and flavourful. The chocolate and vanilla flavours were equally good. And the portion size? WOW. You can see from these photos that we had more than enough for the pair of us! 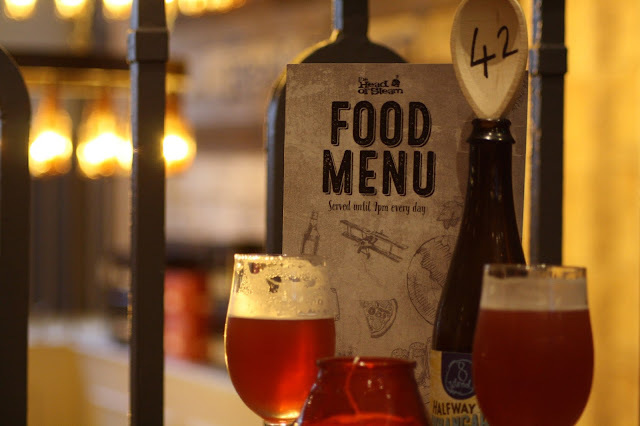 If the Head of Steam excelled at vegan food, their drinks menu was similarly impressive, with over 150 beers (bottled and cask), an enormous selection of gins, and a cocktail menu for you to choose from. Something that I especially liked was that at the bar, the vegan cask beers were clearly marked with a little green sign above the tap. 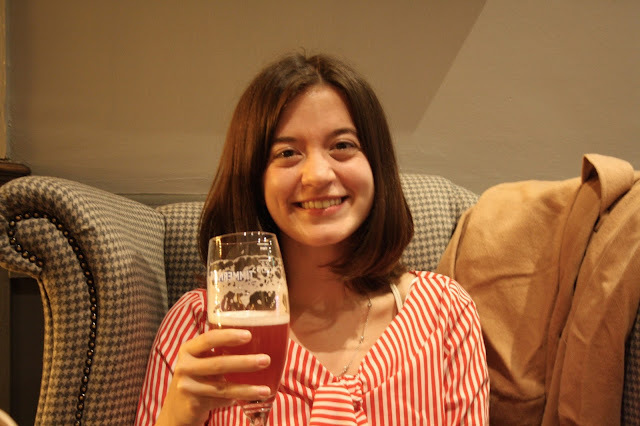 This made it really easy for Ellis and I to make informed selections from the available options without being the awkward customers at the bar asking the barman to reel off the entire list of vegan friendly beers! From the many vegan beers on offer, Ellis and I tried the Timmerman's Strawberry beer which was a pleasant surprise. I'm not the biggest beer lover in the world but this was delicious! This Belgian beer had a refreshing, fresh strawberry taste - it was fruity as opposed to sickeningly sweet like many berry flavoured ciders can be, and I thoroughly enjoyed it. 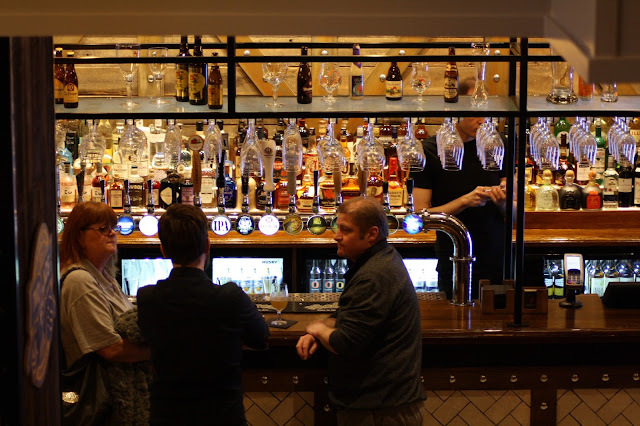 Cask and craft beers are the Head of Steam's speciality. Even the most experienced beer connoisseur is likely to find something they've never tried before on tap here. The pub has a whole set of beers that are regular features and even more guest beers that appear periodically. Many of these casks are not stocked anywhere else in the Midlands! When we chatted to the general manager about the cask selection, he revealed that some beers are expected to sell out within just a few days and when they're gone, they're gone, to be replaced with something different. On every visit to the Head of Steam, you could try something new! Unfortunately the service aspect is where the Head of Steam let themselves down. We sat upstairs in the table-service section of the restaurant and as we were one of the first groups to arrive, our food order was taken promptly and our main courses were brought to us very quickly. We were checked on a couple of times as we ate our mains to ensure that everything was ok for us, which was much appreciated. However, as the night went on, the service did take a turn for the worse. We tried for quite a while to attract the attention of members of the waiting team to ask for some more drinks and the dessert menu. I made eye contact with one of the waitresses several times but on each occasion she walked off again instead of coming over to our table. I would understand this if the venue had been very busy but they didn't seem over-stretched and there were plenty of staff milling about. Some basic customer service requirements were neglected, for example, empty glasses were taken from our table but no new drinks were offered. Knowledge of the menu was also poor, our waitress did not know what flavours of ice cream were on offer or how to place an order for vegan options. In addition to this, there seemed to be some confusion or miscommunication amongst staff about which tables were which, as we had a set of steaks brought over to us after we'd finished our mains which were definitely not what we'd ordered! Having worked in the service industry myself in the past, I know that these issues will be easily rectified with a bit of extra staff training but it was a shame that there wasn't more attention to detail during our visit. Overall, I did enjoy my visit to the Head of Steam, Leicester and would visit again on the basis of the tasty food and wide drink selection. There are a few niggles to be improved upon but I'm sure that over time, this will become a successful venue for Leicester. The pub is centrally located on Market Street, close to the Town Hall and City Rooms. Do you have a favourite pub? Let me know in the comments below! My April advertisers are equally delicious! 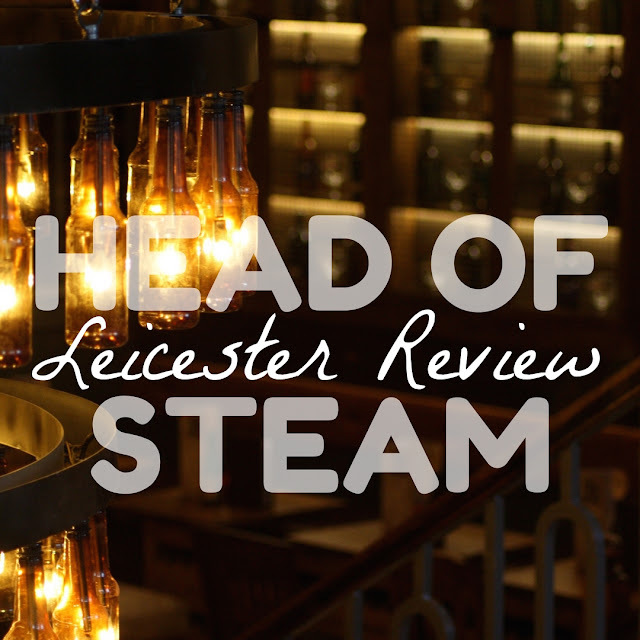 *Our meal at the Head of Steam was provided free of charge in exchange for a blog post review.